As far as Paste’s opinions on the craft beer industry are concerned, we’re typically not very kind to the handful of former U.S. craft breweries now owned by Anheuser-Busch InBev. Chief among those in terms of national prominence is Goose Island, the first major acquisition by the company in 2011, the purchase of which started a domino effect that led to the acquisitions of Elysian, Four Peaks, Golden Road, Wicked Weed and more. In fact, it was only recently that I wrote a long deep-dive piece on Chicago Tribune reporter Josh Noel’s new book on the Goose Island sale, recounting all the things I’d learned about AB InBev in the process. But we also believe in a few other things at Paste: Namely, giving credit where credit is due in terms of the beer a company produces, and attempting to err on the side of common sense when it comes to what the consumer should expect from a company. 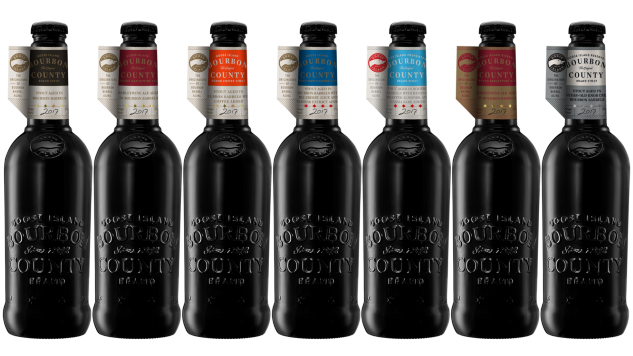 Case in point: We’ve always enjoyed Goose Island’s classic Bourbon County Brand Stout. Long revered as the godfather of American barrel-aged stouts, there’s quite a lot about the genesis of the beer in Noel’s book, but what’s never changed is our appreciation for the liquid in the glass. Even as the idea of “bourbon barrel-aged stout” went from fantastical in the ‘90s to pedestrian in the modern beer industry, that beer has remained one of the premier examples of the style. In fact, the last time we blind-tasted barrel-aged imperial stouts in 2017, BCBS finished at #5 out of 144 beers. That’s how good it still is, and we respect it as a result. The one big exception, as most craft beer geeks are aware, was in 2015. That was the year that the barrel-aging program at Goose Island stumbled, after greatly expanding in size and scope. That year’s batch of BCBS suffered from an infection of lactobacillus acetotolerans, an unwanted bacteria that led to sour, rancid off-flavors in four different variations of 2015 BCBS. Once word began to get out, the infection issues were a PR nightmare for Goose Island. Beer geeks who had been waiting for AB InBev to screw up the company leapt on the blunder with ferocious zeal. Goose Island was flamed online. But the company responded as it should have: They offered two rounds of refunds to any consumers who purchased bottles, in both January and July of 2016. In fact, according to Noel’s book, the company actually ended up giving much more money away in terms of refunds than there actually was BCBS sold, implying that many fake refunds were collected. However, that wasn’t good enough for certain customers. Jeff Roach and Scott Kaplan, two residents of Massachusetts, brought a lawsuit against Goose Island in Feb. 2017, saying that they had been unable to get refunds during the offered windows because the process was “underpublicized and available for an unreasonably short period of time.” Each had bought a large amount of the beer—Roach spent $600 on about 40 bottles of various BCBS variants, and Kaplan bought 15 of his own. Understandably, the men were angry about buying that much infected beer, although one would think that logically this would have made them very eager to take advantage of the refund window … which they did not. The truth, however, comes out in court. According to a story—once again by Noel in the Chicago Tribune, because that only makes sense—Goose Island responded to the lawsuit from Roach and Kaplan with a combined offer of $8,000, which would have been $5,000 for Roach and $3,000 for Kaplan—”the maximum amount potentially available to them … plus additional funds to cover court costs and attorneys’ fees,” according to the brewery’s legal team. Obviously, this is much, much more than the literal cost of the beer for both men. Roach spent $600 on his bottles, and was being offered nearly 10 times as much for his troubles. Seems like the reasonable thing to do would be to accept the money, right? Well, that’s not what Roach and Kaplan did. Instead, their lawyers returned the checks, saying that they wanted to press forward with a class action lawsuit in which more wronged parties would presumably come aboard. Or in other words: They saw dollar signs and hoped to get even more than a 10-times return on their initial expenditure. And damn it, they were right. The judge agreed, and the case has been dismissed. Presumably, Roach and Kaplan will now receive nothing at all—punishment for not simply accepting what was already a generous offer for the inconvenience they experienced. We’re never going to be fans of AB InBev, here at Paste. But today we’ll say it: Good for you, Goose Island.